Kauto Star proved that class is permanent with a quite brilliant win in the Betfair Chase at Haydock on Saturday. KAUTO STAR DEFIED his years to win the Betfair Chase at Haydock on Saturday. It was his fourth success in the race. Paul Nicholls’ charge was always prominent under Ruby Walsh throughout and managed to put Long Run under intense pressure with a superb round of fencing. The Gold Cup winner was left to rue mistakes at two fences down the back straight and, once Walsh’s 11-year-old had broken free, Long Run was never able to get to Kauto Star who scored by eight lengths at the finish. The 6-1 shot, who returned to an incredible reception, was immediately cut to 5-1 from 16s for the William Hill King George VI Chase at Kempton on Boxing Day. 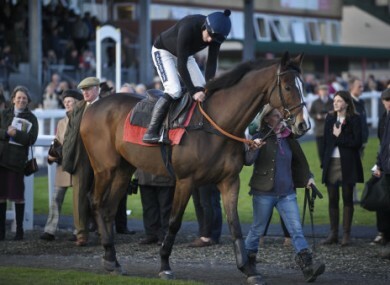 Email “Not done yet: Ruby Walsh guides Kauto Star to brilliant win”. Feedback on “Not done yet: Ruby Walsh guides Kauto Star to brilliant win”.